Shaken, stirred, flung together in a mason jar, nothing beats a Martini cocktail. Bond, James Bond, was right all along. A gin (or vodka) based cocktail, mixed (shaken or stirred) with dry vermouth to produce a simple, sophisticated and powerful cocktail. Who knows? Allegedly San Francisco, but success has many fathers so plenty of other hotels / bartenders / manufacturers lay claim to inventing this king of cocktails. Mostly, the gin or vodka it’s made with, so the level of botanicals with which your primary spirit is infused is the key flavour lead. A Martini is usually prepared in a cocktail shaker with ice, with the drink then being strained into a Martini glass. But a Martini can also be served ‘on the rocks’ (i.e. over ice), in which case it’s served in a tumbler. Whole books have been written about this most sophisticated yet simple cocktail. Entire books. About a cocktail. What’s so good about a Martini, other than everything? Purists will argue for hours about gin versus vodka, ratios of dry vermouth, garnishes and whether or not adding any other flavour – from olive brine to espresso – means it can no longer be considered a Martini. As with so many other cocktails, spirits and popular recipes, the Martini’s provenance is unclear. Martini invention is claimed by an Italian vermouth maker, the Occidental Hotel in San Francisco and a bartender in the town of Martinez amongst others. Wherever, whomever, it was already popular in the mid 1850s and became firmly entrenched in the 1920s when, during Prohibition in the US, illegally distilled gin was relatively freely available. The original Martinis (of the early 20th Century) were made with two parts gin and one part dry vermouth (2:1) with a dash of orange or aromatic bitters, but have evolved over the years to include vodka instead of gin as well as changing the ratio between the gin/vodka and vermouth significantly. The world’s most iconic cocktail simply must be the Martini. Carrie Bradshaw’s Cosmopolitan or Don Draper’s Old Fashioned simply don’t deliver the same panache as James sipping his “shaken, and not stirred” aperitif. Introduced by Ian Fleming in Casino Royale, his first Bond novel, the Vesper Martini is “...large and very strong and very cold and very well made.” But you’ll actually only ever be able to make an imitation version as one of its few ingredients, Kina Lillet, is no longer produced. Fleming’s recipe called for 3 parts Gordon’s Gin, 1 part vodka, ½ part Kina Lillet, shaken until it was very cold and garnished with a large thin slice of lemon peel. Although if you were aiming to follow in 007’s footsteps, you needn’t worry as James only ever ordered a Vesper Martini once. In future novels his tipple of choice was the Dry Vodka Martini. 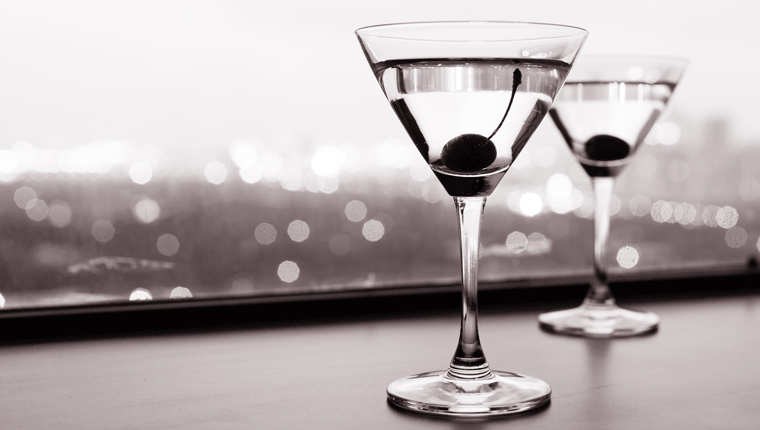 A Dry Martini has a high gin/vodka-to-vermouth ratio. Depending on your taste, you can reduce the amount of dry vermouth to negligible amounts, some choosing simply to waft the vermouth bottle over the gin/vodka-filled Martini glass. The less vermouth, the drier the Martini, and Bond’s preferred ratio is six parts vodka to one part vermouth (Live and Let Die). A Wet Martini, ironically, uses more dry vermouth than a Dry Martini. Usually a Wet Martini is prepared using an equal ratio of gin to vermouth. And a Perfect Martini is made with equal parts of sweet and dry vermouth to accompany the gin/vodka. A Dirty Martini involves the addition of (green) olive brine to the cocktail and is usually served with olives as a garnish, and did you know that if you add a cocktail onion to your Dry Martini it becomes a Gibson? Add some absinthe to your Gibson and you’ll be enjoying a Third Degree Confused that such a simple cocktail, only using two (or three at most) ingredients, can be prepared in such a variety of ways? It’s a contentious issue all right, as the number of articles on the subject highlight. Just be prepared for 20 bartender questions when you place your next Martini order. Or better yet, try them all at home and discover which is your favourite. Let’s be clear, a classic Martini isn’t for the faint hearted. 100% alcohol is for sipping not slurping. Given that it’s predominantly gin or vodka based, it’s here the flavour starts. A gin base will provide different botanical flavours depending on the brand of gin. If the gin’s herbal flavours are too strong, go for a vodka base. The amount of vermouth (usually dry but can be sweet) also influences the flavour. As vermouth is also flavoured with botanicals, if you want a drier, less perfumed beverage, up the vodka and reduce the vermouth. And finally, adding garnishes will give your Martini that final flavour kick. Some lemon peel will add a pop of citrus for example, a pearl onion will provide a tart, almost sour flavour whilst adding olive brine delivers a more viscous, salty essence. As it’s primarily an aperitif, Martinis are best enjoyed with cocktail snacks; hors d’oeuvres such as roasted nuts, smoked salmon blains, antipasto, oysters or even just good ol’ potato chips. The saltier the better – a Martini does not enjoy the company of sugar.